You think this may be a good fit for the players/fans? if so why? I think their gonna do whatever it takes to get that 18-19 game schedule. This would definitely help that cause, if not seal that deal. Good for the fans, but I don't know about the players? Well I ask about the players because it may be unfair to some divisions. If you add 2 teams, then the whole point of the merger in 02 was pointLESS. It would've been better off to keep it as EAST WEST and CENTRAL divisions in both conferences. If you split them up in different conferences it may manage to be ok, but that might be an indicator of possibly more than just an 18-19 game season. I agree it'd be better to keep the Divisions the same. I also agree that there will be more gains to each Franchise other than an increase in schedules. I'm all for growth, so I think it's a great idea to expand the season. I just watched the conference a few hours ago and Goodell denied that the information was true, but I think the denial made was full of crap judging by how it was said. I believe this will be a "behind closed doors" discussion until maybe the end of the 2013 season if not earlier. LA couldn't even keep a team, what makes them think they would keep it now? California does not need more teams. Goodell is the worst commish I've ever seen. This guy came into office believing "bigger is better" and hasn't let it go. Games in London, expanded schedules, etc., and now two more teams? It would throw everything out of wack, as well as water down the league. Look at some of the teams in the NBA. I just don't get it. San Antonio Wetbacks for the win!! I would totally support them, no joke! It's bad enough he drained the toughness out of the league now. As a big fan of Defense, the act of Goodell being so Afraid of letting the players play but yet adding more teams and extending the schedule which in my opinion will CAUSE MORE INJURIES, and shorten careers. If Ray Lewis came into the league the same year as Goodell, he wouldn't even be in the league right now. Caring about what the fans think is fine, but the fans dont play the sport they dont go through OTA's/Training camps and it's seems to me Goodell doesn't really give a **** of what the players think. I think it would be cool add a team in LA and possibly one in Toronto or OK City. I doubt OK because the market is very small there. Seems to me that the games in London are only regional; what is the point of shipping these games out there if they aren't going to televise them nationally, if you are a fan of a team playing in London and you don't have DirectTV, you are out of luck with a future grandson in a dog collar... and the fact that you put in Unpopular match-ups such as the Bucs v. Patriots or Bucs v. Bears,etc. they only got 1 out of 4 match-ups right for the London game and that is terrible.... I just don't see this lasting long. It would be great for LA to get an NFL team as long as the 34th team was somewhere in the US. Yeah, I live a couple hours away from OKC and I just don't see a professional football team fitting into a town that already has problems selling out Thunder games. This year has been different because the Thunder have been playing dam good ball and have the best record in the league. They have a population of around 550,000 which is a very small market. Yea, I hate London games. If anything, I would at least rather a preseason game held there instead of an actual game. It just doesn't seem fair to me, like you said, that fans of the "home" team can't even be there with the team, unless a hefty wad of cash is spent to travel there. Why does LA need a team? They had multiple chances. More than most cities, and it does not work. Might as well find two markets outside LA, because 5 years after LA has a team, the team will be moved. I see this has come up again so let me weigh in with a UK viewpoint. Whilst i'm a fan of the London games and have been to 4 out of 5 of them I don't think an expansion team would work here in the UK. Most of the fans here have their own teams as it is, so unless they were going to move an existing team over here it wouldn't work. If you were going to have teams outside of America then you'd likely need to have a whole division in say Europe to ease the travel and jet lag burden and that would mean 4 more teams and a dilution on player talent. Most people would say that there aren't 32 NFL calibre starting QBs so imagine what that would be like with 4 more teams! 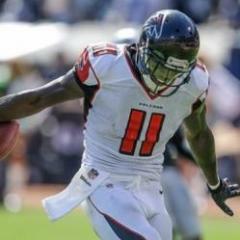 I would love for the NFL to bring the Falcons over here to London but only if it was a road game as i'd want my first Falcons home game to be in the Georgia Dome. Which is why they just need to move the Chargers there. They were saying that in order for LA to get a team, they would actually have to take in two teams. Not sure why but it was apart of the Blank/Cowherd interview during media week. Would like to see LA and either San Antonio or OKC get a team. I wouldn't move Chargers, I would move Raiders first. Why? They've been there before and the Oakland fanbase is fantastic. There's literally no reason to move the Raiders back to LA.